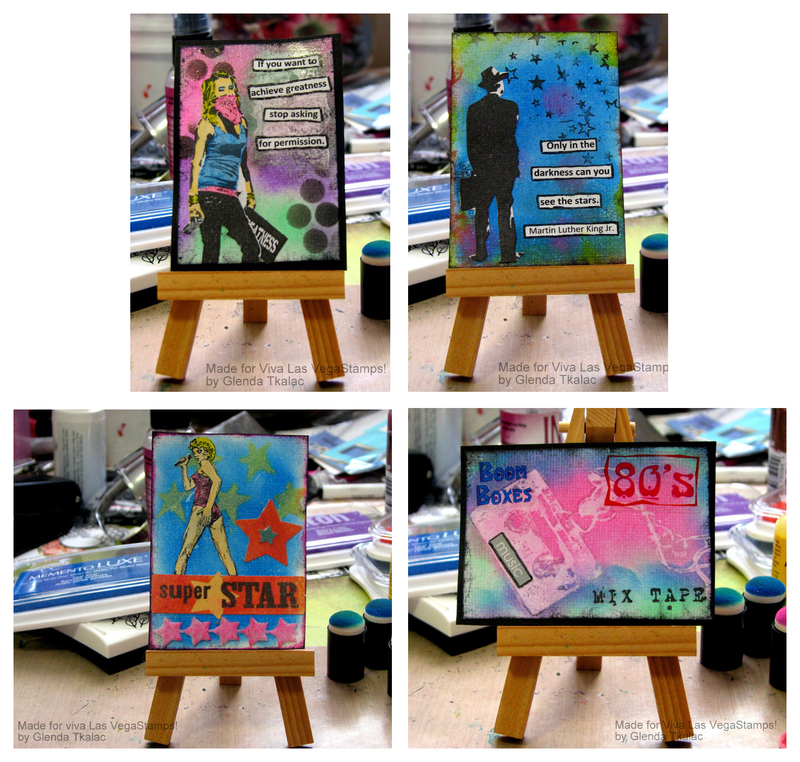 Welcome to the IMAGINE Crafts and Viva Las VegaStamps! Blog Hop. For the next week, our two design teams will be featuring some amazing projects featuring products from both our companies. Amazing stamps require amazing ink, right? 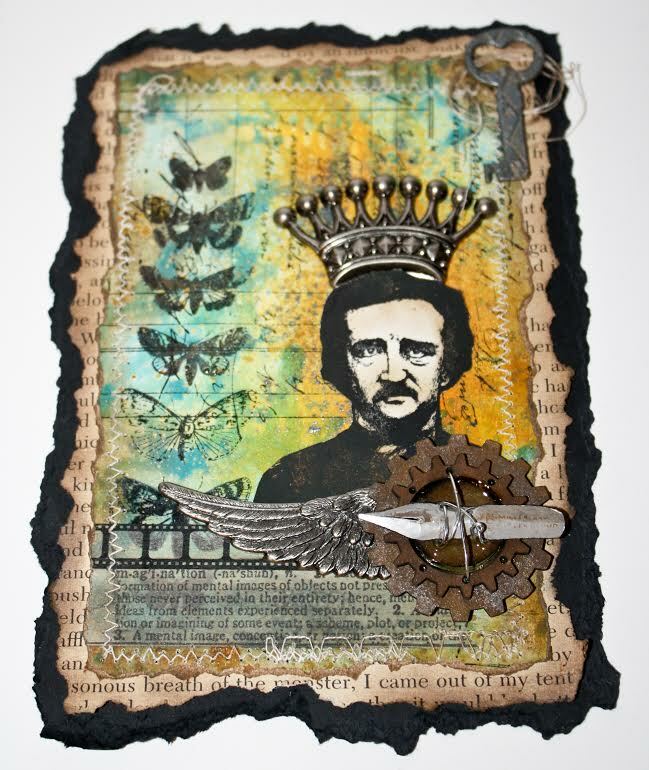 We're proud to announce your chance to win one of three different Mixed Media Prize Packages from IMAGINE Crafts and Viva Las VegaStamps! You have until midnight PST on Sunday, May 31st 2014 to comment on as many of the Design Team Blog Posts from this week as possible. On Monday, June 1st we’ll draw three random blog posts and one comment from each of those posts will win a prize package! Ready for some inspiration from our artists? Tasha says "Very soon is summer and so wanting to see the sea ... It's probably why I chose the theme of the sea for my panno. However, it is not all about the sea. Hope is a lighthouse for dreams. And if you believe in your dream, then you can reach it through all the storm. 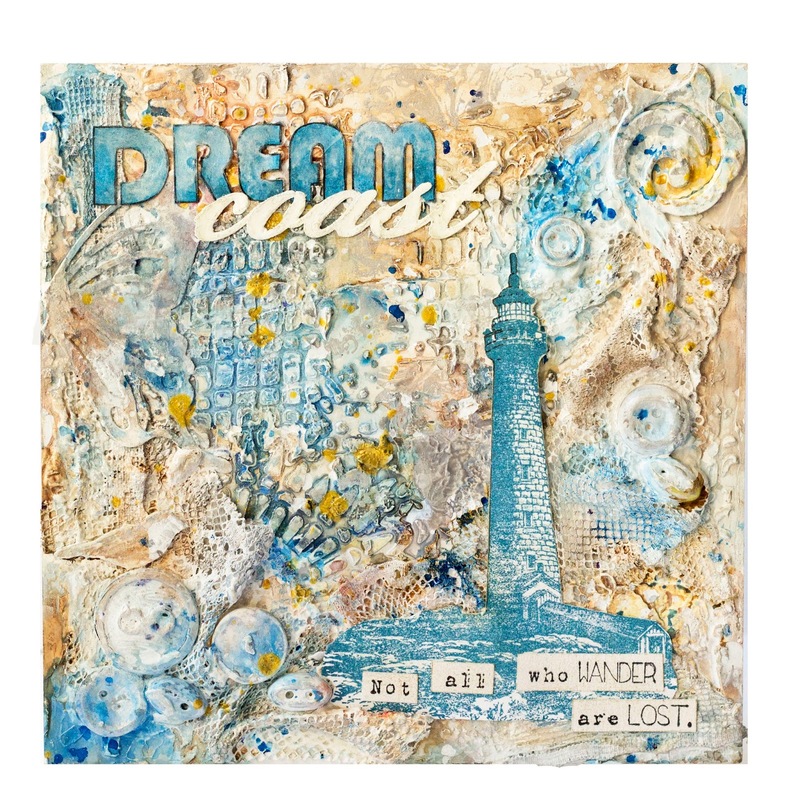 To your Dream coast. For background I used watercolor, stamping with Delicata silver Ink and irRESISTible Gold spray." Visit Natasha on her blog to see the details. Momento LUXE, Ink Potion #9, IrRESISTable, VersaFine, Kaleidacolor, Delicata, Tsukineko sponge Daubers. Waybill/Invoice Background, Butterfly Specimen, Poe, Miracle Tape. Tera says "I mainly used a spritz and drag marbling type technique which can be found in my tutorial, as well as ink dauber for sponging on all of my Sepia ink for a fully distressed look." Stop by her blog to get all the details. ***Blog Hop Hint – if you click on a link that takes you to a page saying something like, “Sorry this page cannot be found” just click on the header at the top of the blog (usually a picture or the blog’s name) and it will take you to that blog’s most recent post. That post *should* be our hop. If not, you can probably scroll down a short way to find the hop post. ALSO >> We're having a DESIGN TEAM CALL. Stop by and check it out :) Last Day! Radiant Neon, VersaFine, Memento Luxe, Fireworks!, Walnut Ink, Creative Medium, GooseBumps, Sponge Daubers. 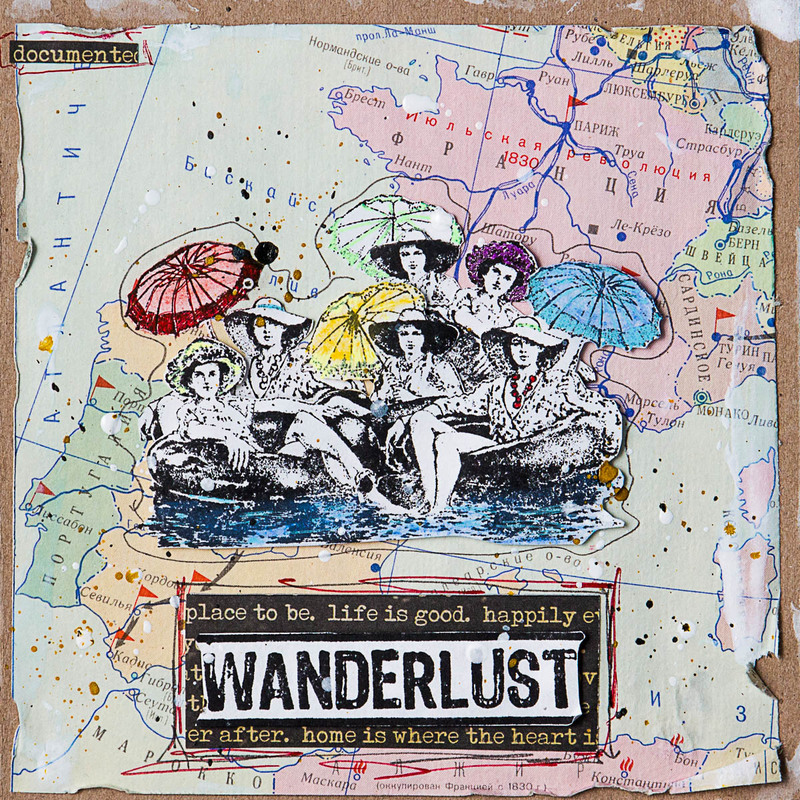 Be An Adventurer, One Way, One Way Small, Children Playing on Toy Car, Map Background, Washi Grid Background. 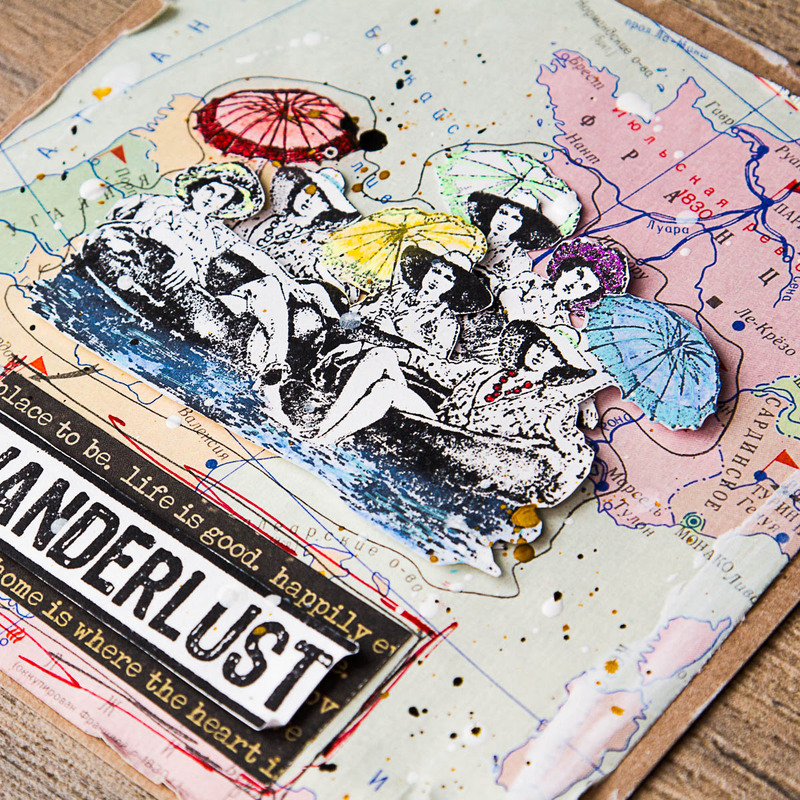 Mellpellmell says "As you remember I've shared simple card I've made for my friend who is the avid traveler. So now I'll show you picture-motivator made for her too))) Of course It's about traveling too))) At first I made ​​the background with structural pastes and mask. Then I added color and depth for background using Fireworks!, Walnut Ink, and the stamps. Then I added different paper scraps a little, rub-ons and stamp (Children Playing on Toy Car ), painted with watercolor. At the very end I added an incredibly (!) beautiful splashes using the GooseBumps and some pen lines." Get full details on her blog. 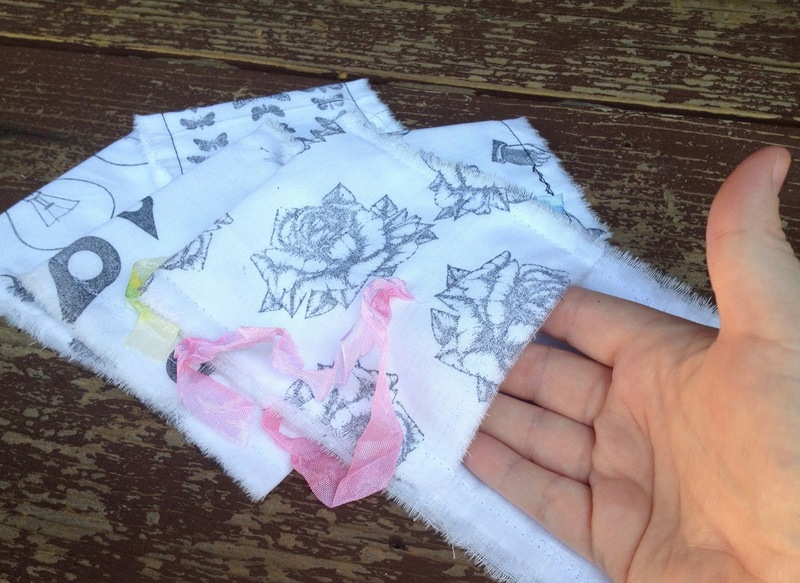 Mary says "For my project, I've created this simple layout on fabric! I love how the Memento Luxe inks give almost the look of watercolor when watered down, but keep their vibrancy and the bit of stamping done on the embroidery hoop and ribbon with the Waybill/Invoice Background add a lovely contrast to all that color. And do you recognize those butterflies?? 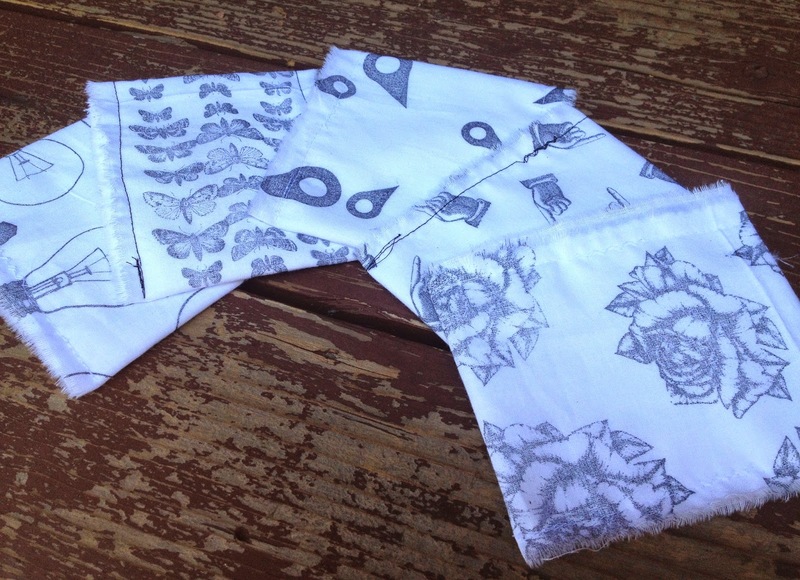 Yep--I've embossed the Butterfly Specimens stamp onto vellum and daubed a bit of color on the back." More details on her blog. Brilliance, Fireworks,Radiant Neon, Versa Color. Staz On, Walnut Ink. Memento Luxe, Fireworks, Radiant Neons. Singer Back, Mix Tape, Mixed Tape, Banksy Graetness Spray Painter, Stars, Businessman Silhouette. 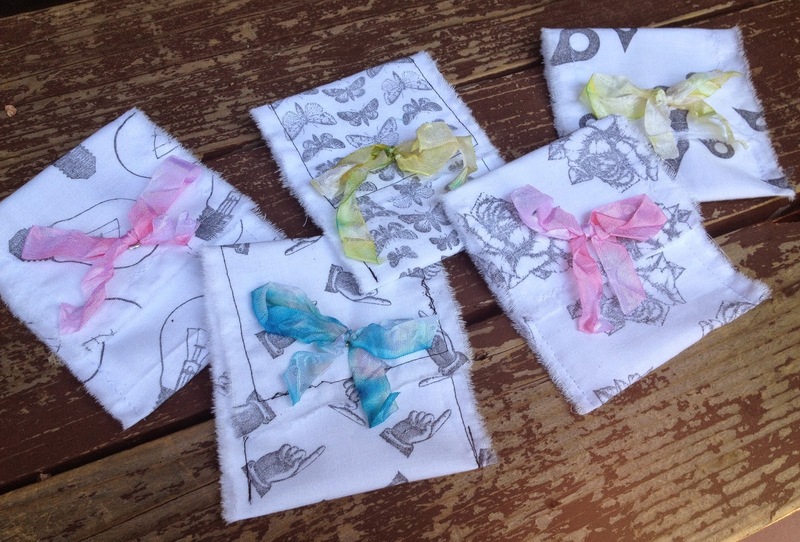 Glenda says "Hi everyone, Glenda here with some ATC’s I made using the amazing products we were so generously given by Tsukineko!!! I will say that I fell in love with the neon ink pads, I think it’s the 80’s child in me which led to these two 80’s style projects." 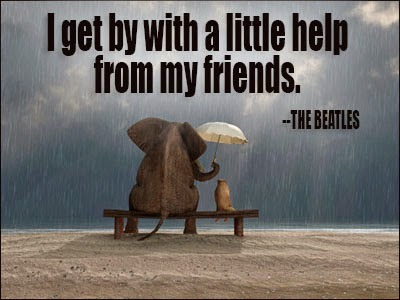 Stop by Glenda's blog to see details. Hermine says "Start with a blank notebook, glue the pages at the edges. Cut out a square in the middle and a rectangle on the right hand side (as big as a matchbox). Glue the edges of both shapes. Cover the whole spread with modeling paste and a layer of gesso. 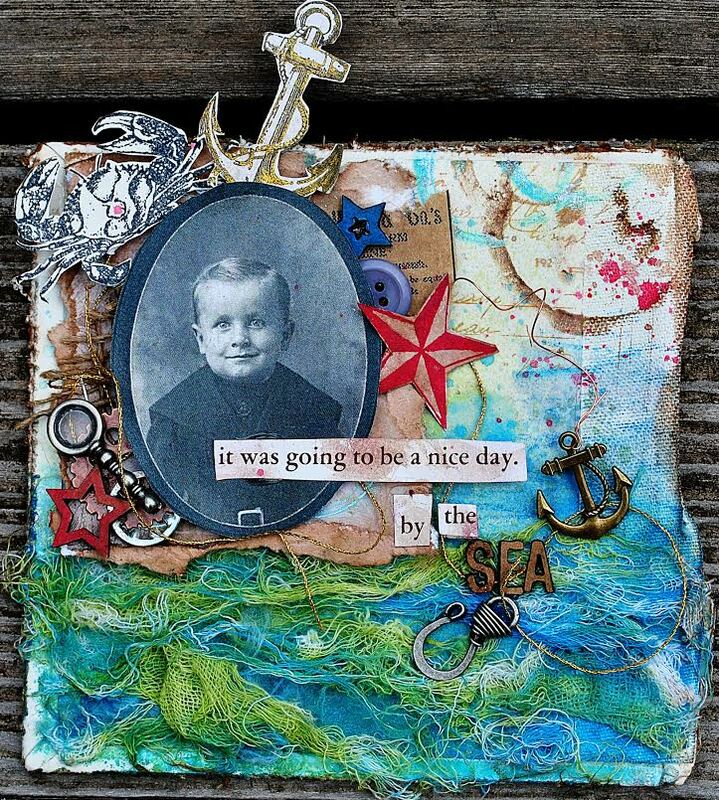 Give it some color with firworks spray and enhanced with other shapes and stamps. Put some bottles in the square and the matchbox." Visit Hermine over on her own blog to get all the details. I love making Gelli Plate prints with acrylic paints and mediums, but had been wanting to create several prints with ink instead. So this was the perfect opportunity. Using several techniques, I applied Memento Luxe Ink to my Gelli Plate, creating one yummy later after another. 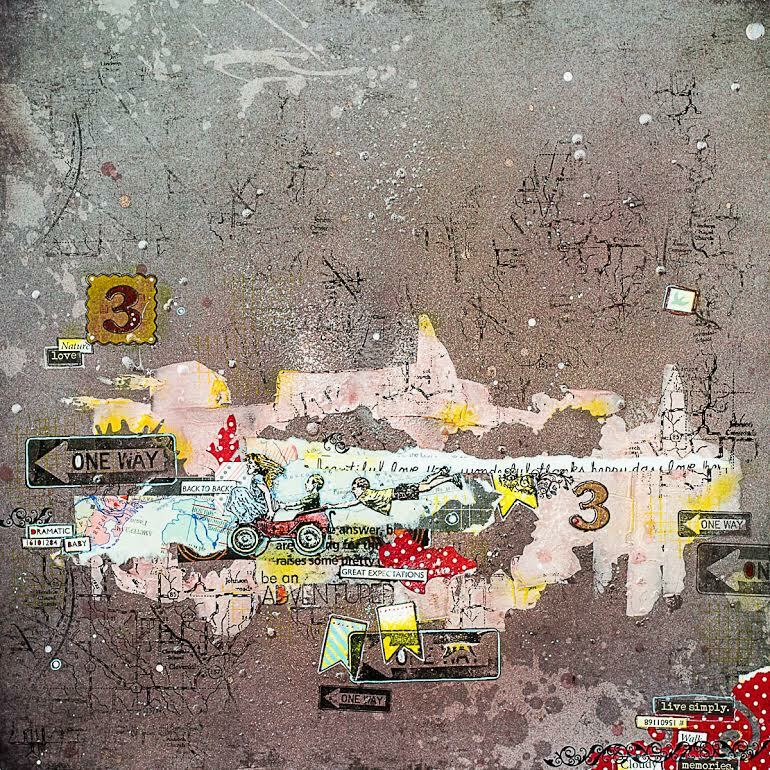 Some prints were made by applying the ink directly to the plate(1), randomly creating layers of color, while other prints were made, using stencils for more pattern and design (2). For my Art Journal page, the background was created using the above method (1). I stamped (with Versafine ink) the edge of my page with 'Whimsical Diver' and 'Color Wheel Lines'. I added a bit of doodling with Memento Markers and it was complete. For the center of my page, I stamped 'Hand Circus', then doodled again. I finished my page off with my quote. Viola! Easy peasy! Using Gelli Print method (2) above, I stamped (with Memento Luxe Ink) a print with 'Zentangle'. 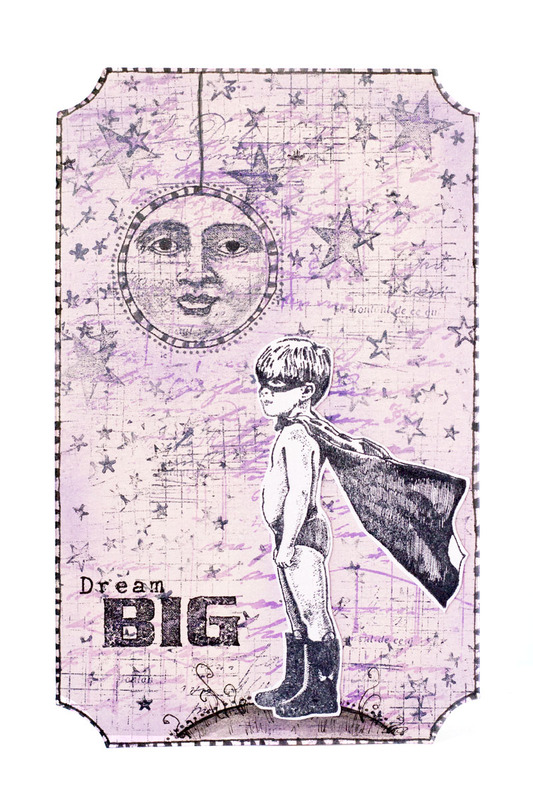 I then cut cut randomly size rectangles stitched them to a larger Gelli Print. There is so much depth of color and texture. 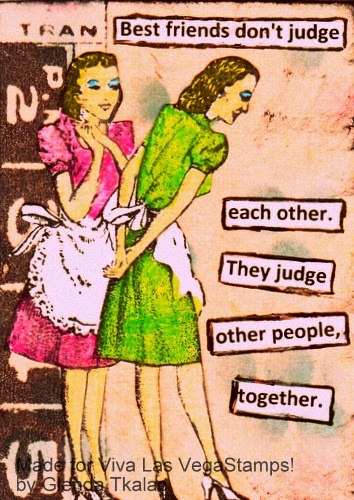 Just love this! 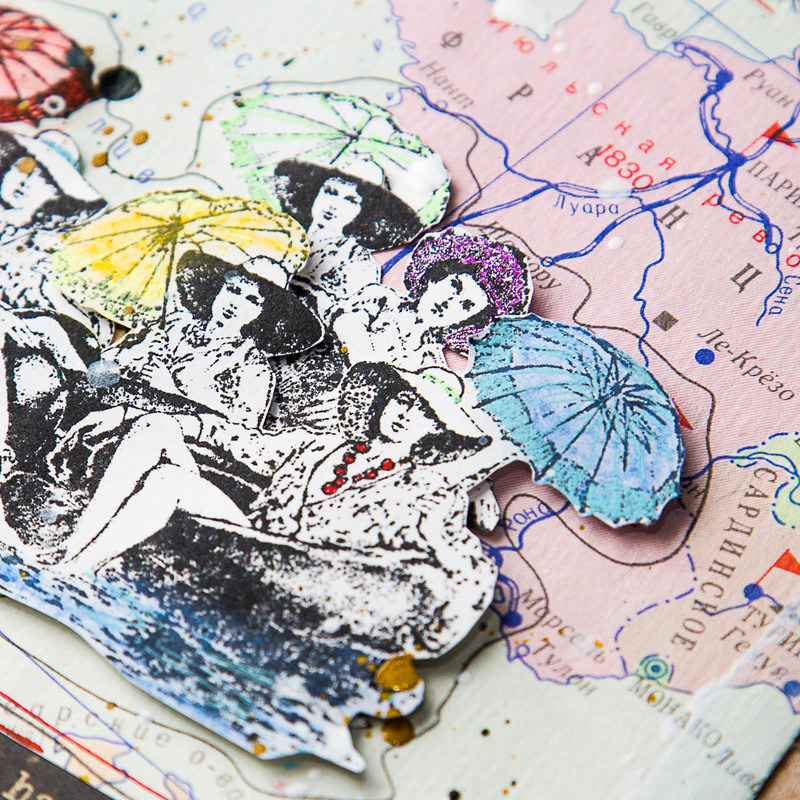 To bring in the same pattern from the Gelli Print, I also stamped (with Memento Luxe Ink) painted chipboard alphas for a whimsical touch. 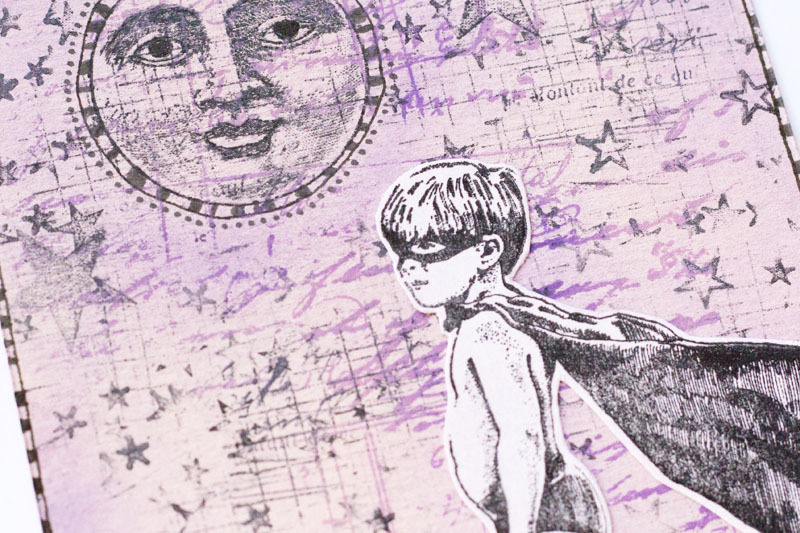 For more texture, I covered my white cardstock with Creative Medium through a stencil. It's a subtle look, but adds so much. I hope you enjoyed my projects today! Have a great one! Please stop by Tina's blog to see more info. If you're just joining us on the Mixed Media Blog Hop, you can go here for yesterday's list of blogs. Versamark in Onyx Black and Smoky Gray. 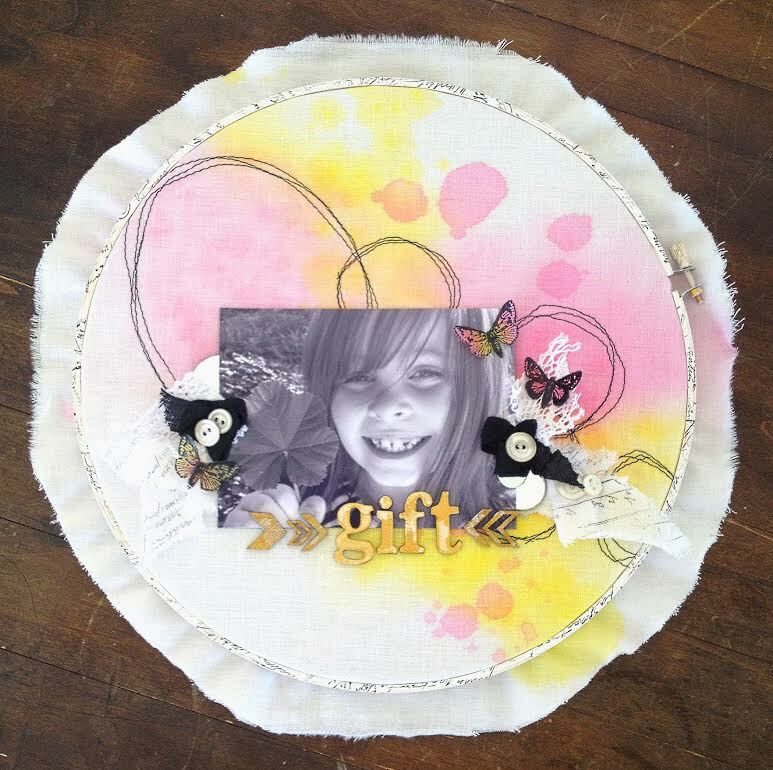 Join DeeDee on her blog to see the full tutorial and a Time2Stamp video on making this tag. 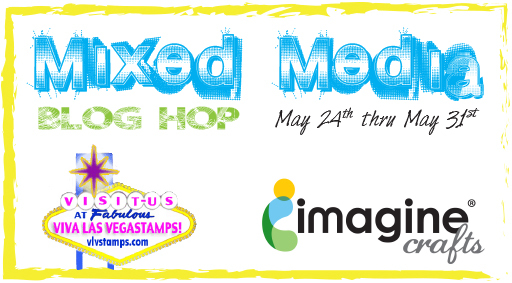 Labels: Blog Hop, imagine crafts, mixed media, Swap, Viva Las VegaStamps! We just sent out a newsletter. Are you signed up? You'll want to be to stay in touch with all things VLVS! Our recent Banksy Plate is now ready individually. Due to popular demand we recently released a plate o' rubber dedicated solely to Banksy inspired images. GOOD NEWS > That plate is now available as individual stamps. 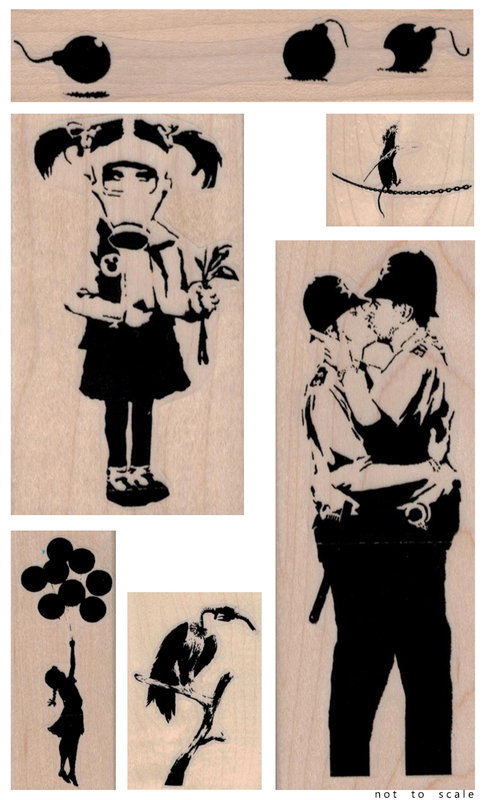 Get the 20 different Banksy inspired rubber stamps unmounted, cling cushioned, or ready to stamp wood mounted. Starting on SATURDAY we'll be doing a week long INSPIRATION HOP with the amazing team from IMAGINE Crafts! And don't forget about our DESIGN TEAM CALL. That was one JAM PACKED newsletter. You better sign up so you don't miss out on the next one! 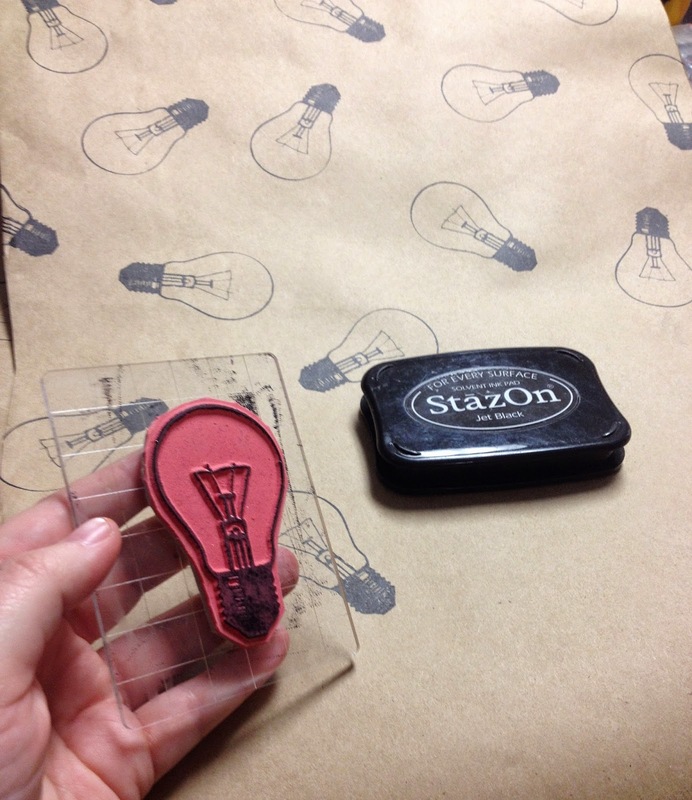 We’re looking for all types of artists and welcome anyone who has a passion for rubber stamping to apply! Bring on the Mixed Media Artists, the Card Makers, the Scrapbookers, the Altered Artists, the Scene Stampers… we want you ALL!! International applicants welcome to apply, too. Our terms last six months. This term will run from July 1st – December 31st and has 8 openings. d. and by submitting to publications. 2) Complete a minimum of two (2) projects per month to be posted on the VLVS! 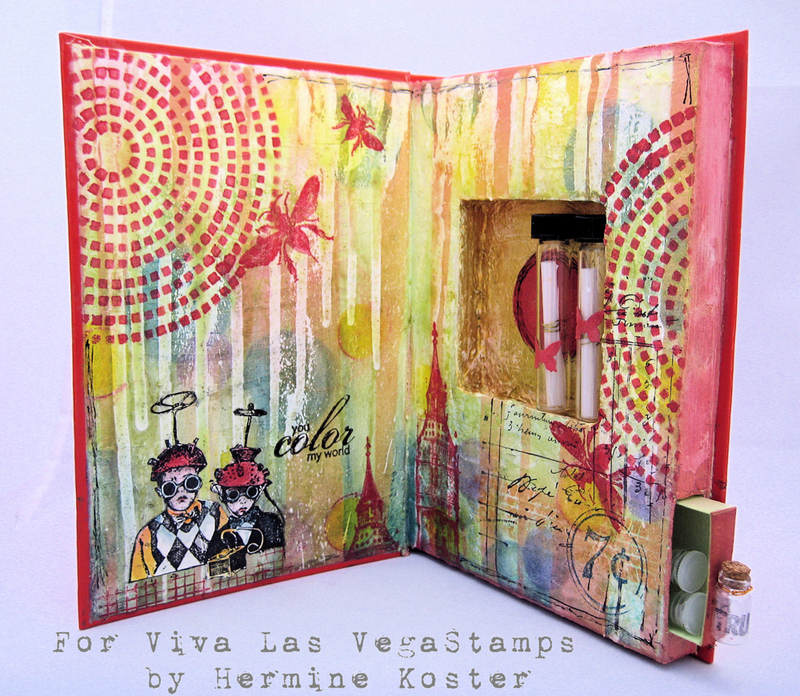 blog, always using only Viva Las VegaStamps! images. Your posts must include at least one over all finished photo, one detail photo, a product list with appropriate working links to our online store and a short description on how you completed the project. Keep in mind occasionally you may be asked to follow certain criteria, ie; using a given product, following a theme, or creating for the season. We may also request an additional post in which case you would only be asked to share a project as inspiration with working links to the appropriate stamps. No need for tutorials or step by steps on inspiration posts. It is important you possess the necessary skills to photograph your projects well. We want to see them in their full glory; you should be able to provide well lit, focused, center of attention photos. 3) Participate in the online private facebook group for the team. Important information like schedules, future hops, logos, links and contact information are all kept in the group. I run a lot of ideas by the team and value their honest opinions. 5) Mail two (2) completed projects to the store for display. This is out of your whole six month term. We love having projects posted all around the store for people to ogle as they peruse through our stamps. 1) Provide you with regular shipments to keep you fully stocked on supplies, including but not limited to VLVS! Stamps, Miracle Tape, Embossing powder, and any product swap goods. 2) Provide you with a detailed schedule at least 2 weeks in advance. 3) Compensate you for extra work outside of the regular schedule. This will be based upon volunteer projects and any extra hops or swaps outside of said schedule. 4) Regularly promote you and your projects through online social medias, as well as display you and your personal blog address on our company blog. 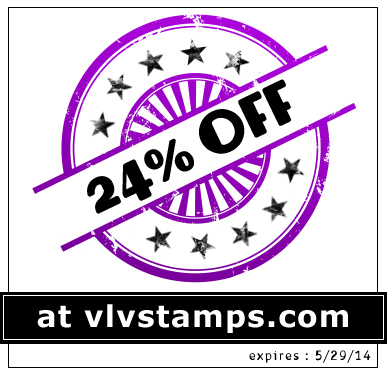 Create a new post on your blog with the title “Viva Las VegaStamps! DT Tryout”. 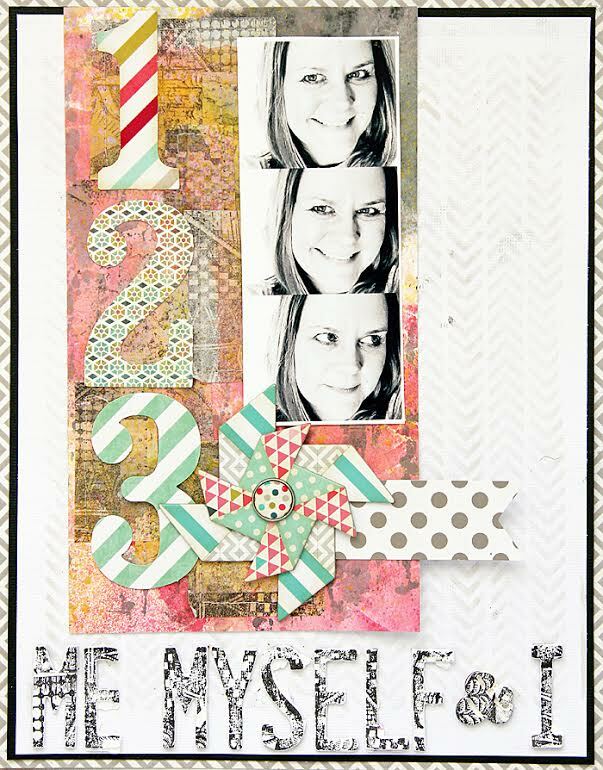 Include in your post three stamped projects that best represent you and your style. I’m open to cards, ATCs, tags, scrapbook pages, etc.! 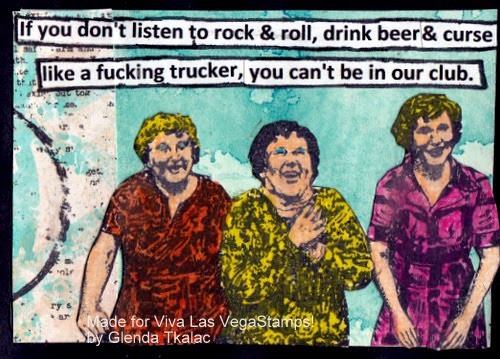 Because I want to see your best work I will not limit the stamped pieces to only Viva Las VegaStamps! stamps, but I’d love to see some if you have them! - a brief bio.. Who are you? Why do you create? That type of stuff! 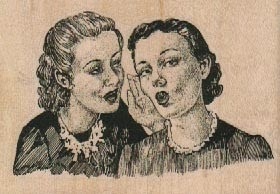 - and last please also include in your post why you want to be on the VLVS! DT. Email to deedee430@gmail.com with subject line “VLVS! DT CALL” due by 5/31 (May 31st) at midnight pacific standard time. Applicants joining the team will be notified by June 2nd. Hi, Maria Potapovich (mellpellmell) is here! Today I want to share with you one litle and very simple card. It was made for one my friend who is the avid traveler - I think it will "hit in the topic". In this card I wanted to show not a tutorial and not the idea! It's just a reminder of a simple technique. 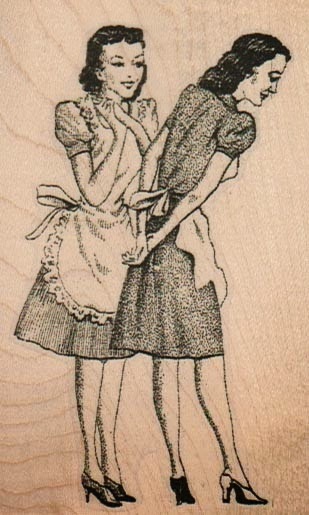 This technique is known as " stamp's increasing". It is much easier than it is called: I took a stamp, put two (or more!) imprints, cut the individual figures and "increased" with their help that imprint, which remained intact. I've made all aforesaid for this card. At the same time "foreground" slightly elevated on 3d foam squares. Sometimes using this technique you can achieve incredibly chic results! So try remember it - it is unjustly forgotten! 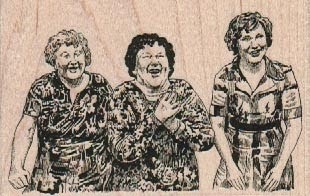 For this card I've used 3 Women in Tubes and Wanderlust stamps. 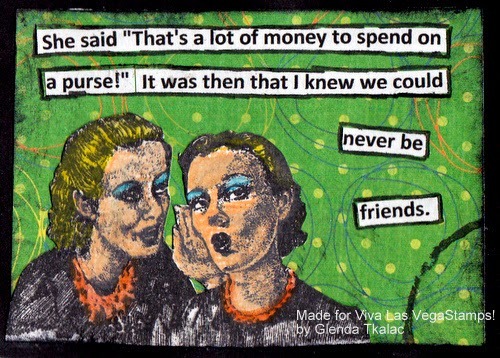 But I need to be honest - 3 Women in Tubes stamp I used not once but twice! Hello, Mary here! Today, I bring you pattern. Not only is stamping your own pattern a great way to jazz up your cards or scrapbook layouts, it's FAB for creating unique gift wrapping, too. 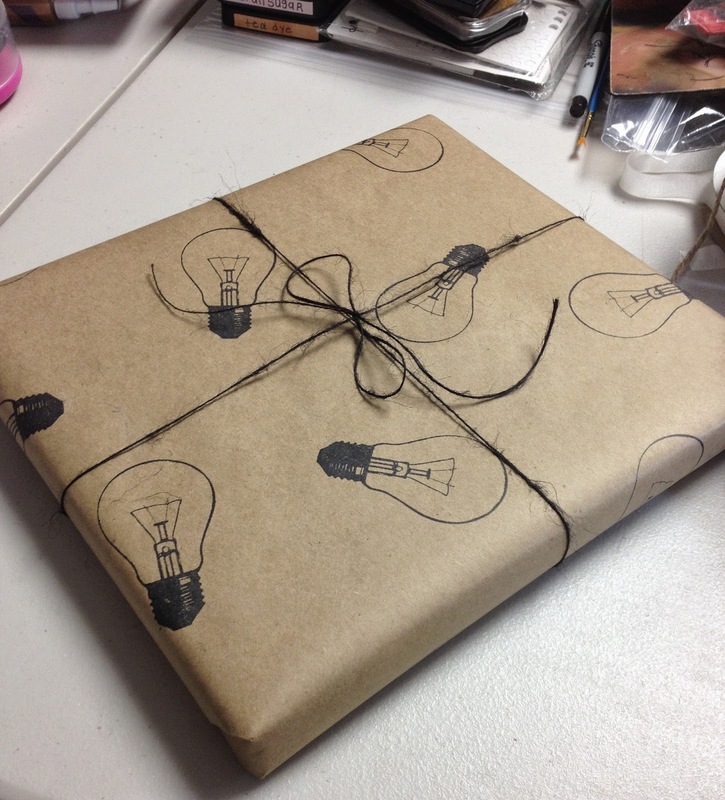 Here, I've stamped the Lightbulb image repeatedly in varying directions onto some simple brown postal paper with StazOn jet black ink to create a fun and funky gift wrap. A bit of black jute, and this package is ready to go!! 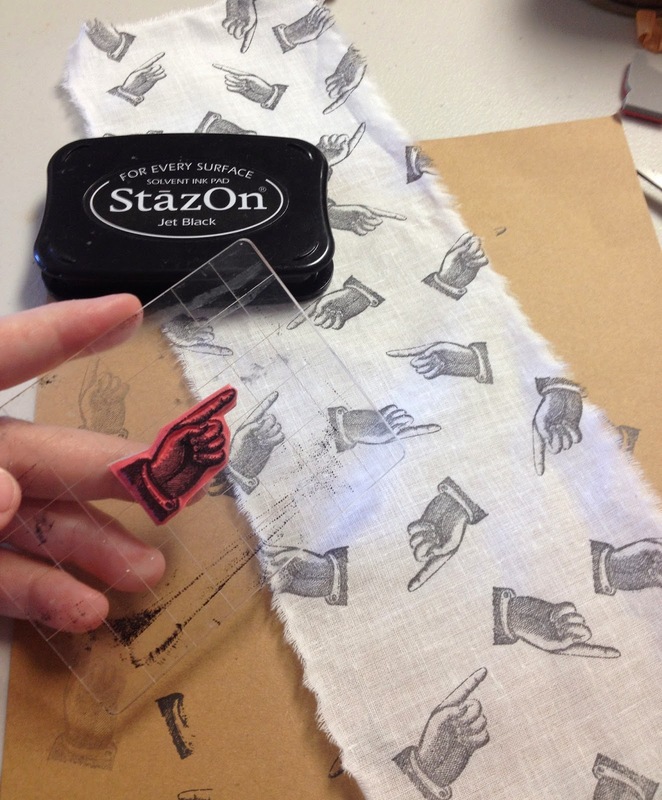 Not only can you stamp onto your favorite papers, but fabrics, too. 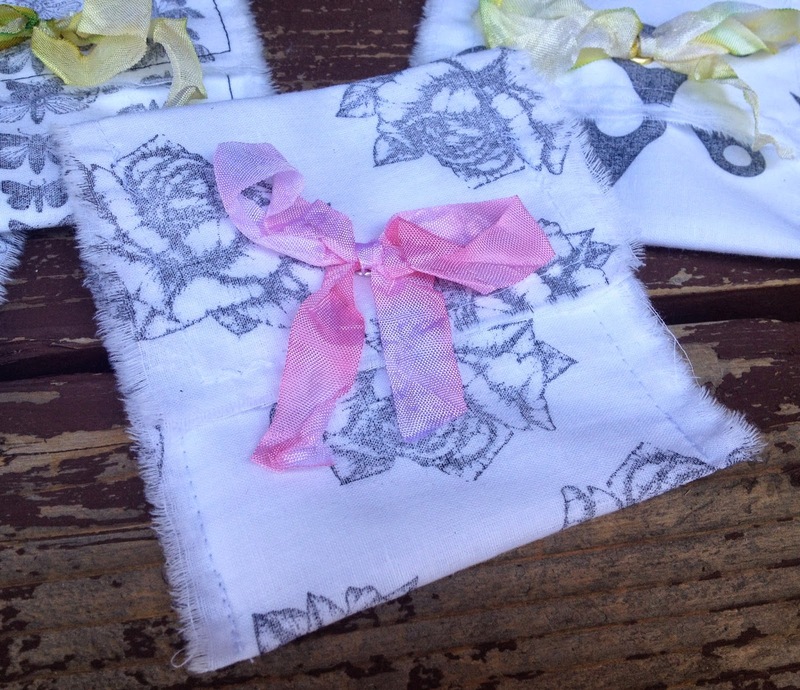 I LOVE personalizing ribbon and creating all types of stitched treasures with my custom stamped fabric. I've found that a tightly woven, smooth fabric lends the best results. Below, I've used a white muslin. It's my favorite for stamping!! And I definitely recommend using a permanent ink. You want those images to stay put through any wear and tear. Once again, I've used StazOn jet black ink to stamp my images every which way. These sweet little pockets are the perfect size for gift cards, handmade jewelry and so much more!! I've simply folded my patterned fabric roughly into thirds and run a stitch along the edges to create a pocket. A bit of hand-dyed ribbon colored up with my favorite Distress Inks stitched to the bottom and an eyelet will keep the pocket closed. And finally, here's a closer look at the stamped pattern on the back. I gotta say, with a bit of paper, fabric and my favorite VLVS! stamps on hand, I may never buy gift wrap again!! Labels: Design Team, distress ink, DT, gift wrap, Mary Brockway, rubber stamp, stamped pattern, stamping on fabric, stazon, Viva Las VegaStamps!, VLVS! Our fifth and final day featuring PanPastels is brought to you by Natasha Serova and she's stamping and pasteling with VersaMark! Here's another shout out to PanPastel and how neat they are to work with. 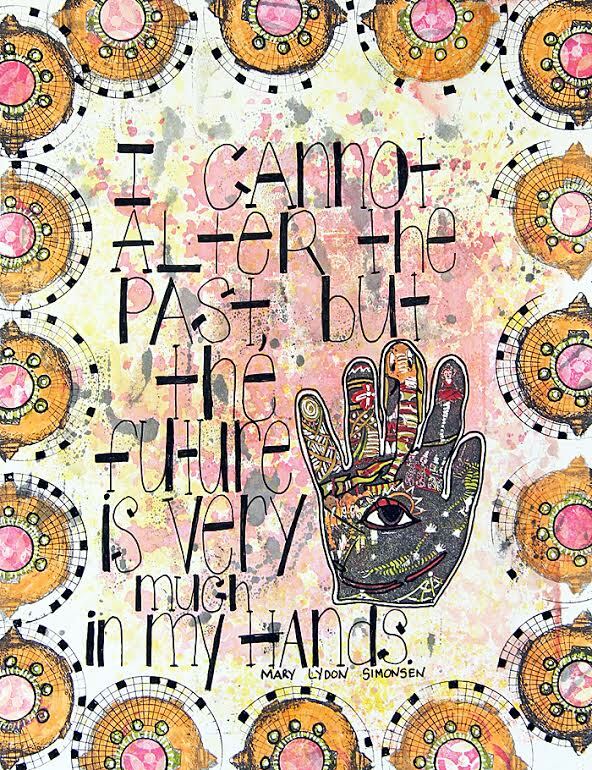 I hope you've enjoyed our week long inspiration! I think you have already seen how steep PanPastel! I'm just crazy about them, really :) I was most impressed by the ability to use it with VersaMark - the effect is simply incredible! And with PanPastel, VersaMark and, of course, stamps VLVS! I made a card about how important to dreaming. Look how chic background turned out! I just toned it using Violet & Permanent Red Tint PanPastel. And this is another piece of background. 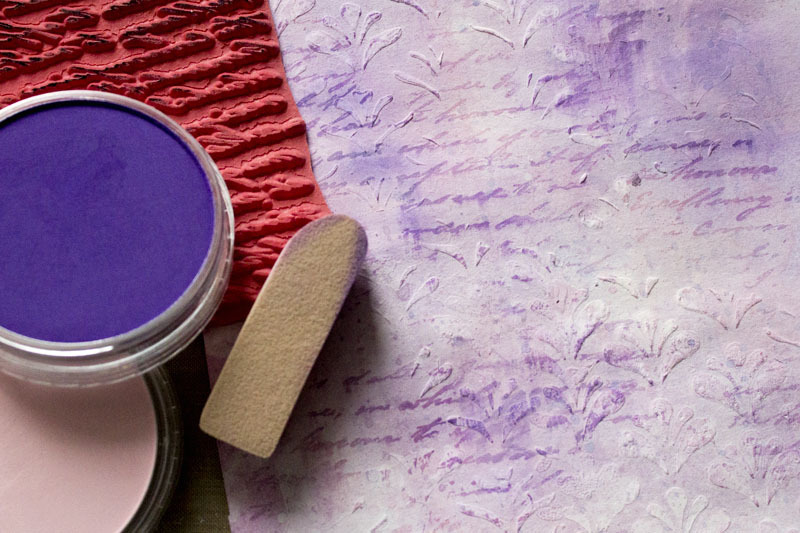 Here you can see how PanPastel allocates pattern made ​​using textured paste. 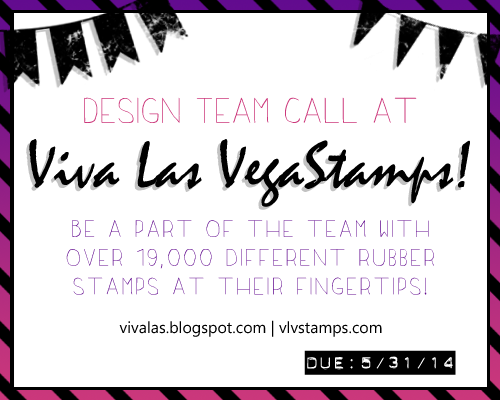 Viva Las VegaStamps & Pan Pastels!